My really good friend is having a milestone birthday today and this is the card I sent her. She is probably going to be REEL-Y mad that I put that large number on the front of the card...too bad!! Are you loving those beachy colors of card stock? Michaels...$2.00...love it!!! Flower was made by punching a scalloped circle several times, spritz with water, wad up, unwad, push brad through centers, push each layer to "wrap" around brad, let dry. Now pull the layers apart a little. FUN !!! Happy Birthday Linda (no last name to protect the innocent). Did you enter the Candy Giveaway? Go here, enter...you might just win! Cute birthday card! 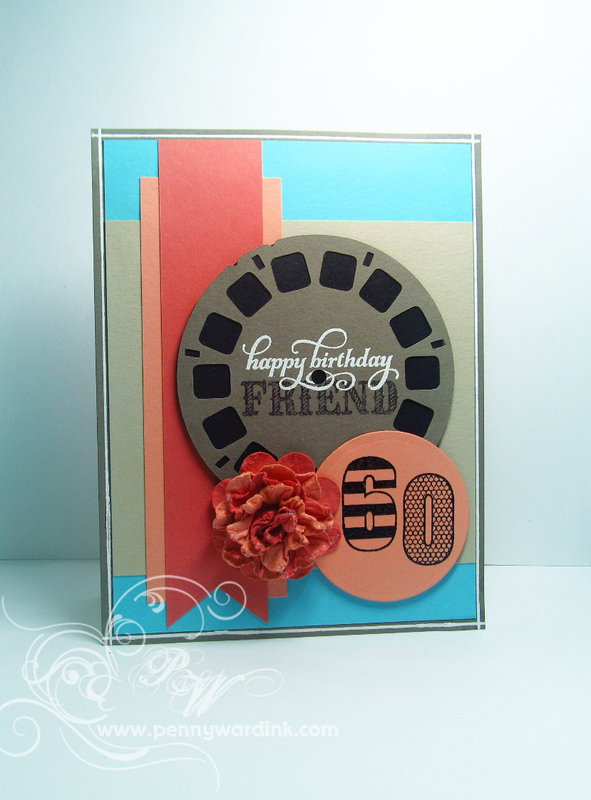 Love the viewfinder die and the quick and easy flower. LUHVE the view master cut from Silhouette, I am SO downloading that today!!!! I don't have a Silhoeutte, but I really enjoy seeing what you can do with one. I love your card and I love your cute white fuzzball in your photo! Reminds me a little of mine!